. . . . . . ……… …………………. This project titled, Liechtensteiner Polka, with the subtitle, Back-to-the-Future as a seven-year old living in a small town learning to play the accordion art project, is finished. Below is a picture of my Father’s accordion, that I used for my later lessons. I still have my little red accordion, but the bellows are bad. 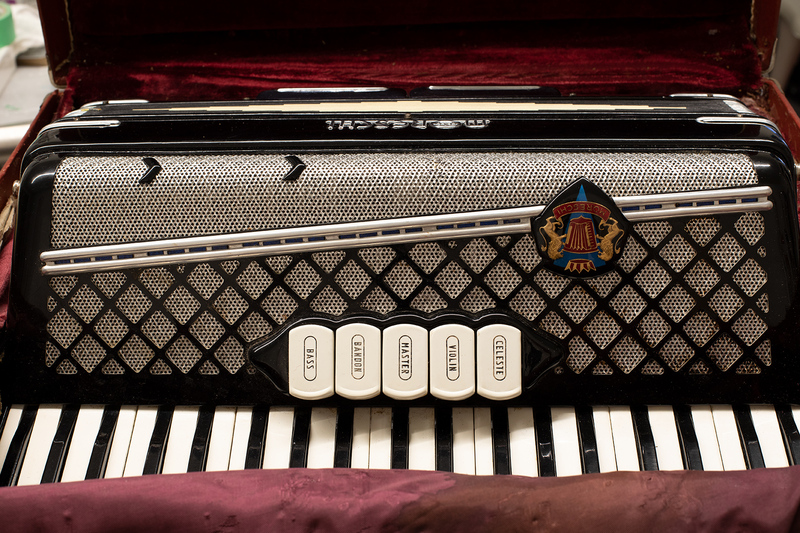 The bellows on this accordion are functional along with all the keys and the bass buttons. Not bad for an accordion over 60 years old that never receive any special care. To my disappointment it worth today what Dad paid for it originally. I did have to adjust the straps, but still found myself struggling to put it on. The accordion is heavy. After a little research on how to play and read the bass buttons, I eventually had the basics of the Liechtensteiner Polka, although not good enough to video the results. This art project is now over, and music from Mozart is up next. To practice my instruments is a decision I have to make everyday in my Studio. I use my Studio time for creating and promoting this Art. Everything else that consumes Studio time than takes away from those goals. The result is that although I would love to play the Liechtensteiner Polka on the accordion, I still cannot. I need more practice. The accordion will stay in my studio to compete for Studio time along with my saxophone, violin, guitar, and my piano. Little do they know that I enjoy listening to great music more than actually practicing music. Maybe this will change as this Art matures, and I am looking for new directions in music. Maybe, would it not be wonderful, if someday I could actually play on any instrument, the Music I paint. ~ by Scott Von Holzen on 05/18/2018.